We have a new, new, NEW, UHDTV in our showroom. The Samsung UN78HU9000 sprang to life in 78” of full UltraHD only a few days ago. Firstly, allow me to endorse giant 78” screens. 78 inches on a UHD screen has the same pixel density as a 40” 1080P HDTV. This means you must press your nose to the screen before you can detect individual pixels. A UHDTV displays four times the detail of HD. The picture is incredible. It’s crisp, sharp, and so full of detail that HDTVs suddenly feel blurry. 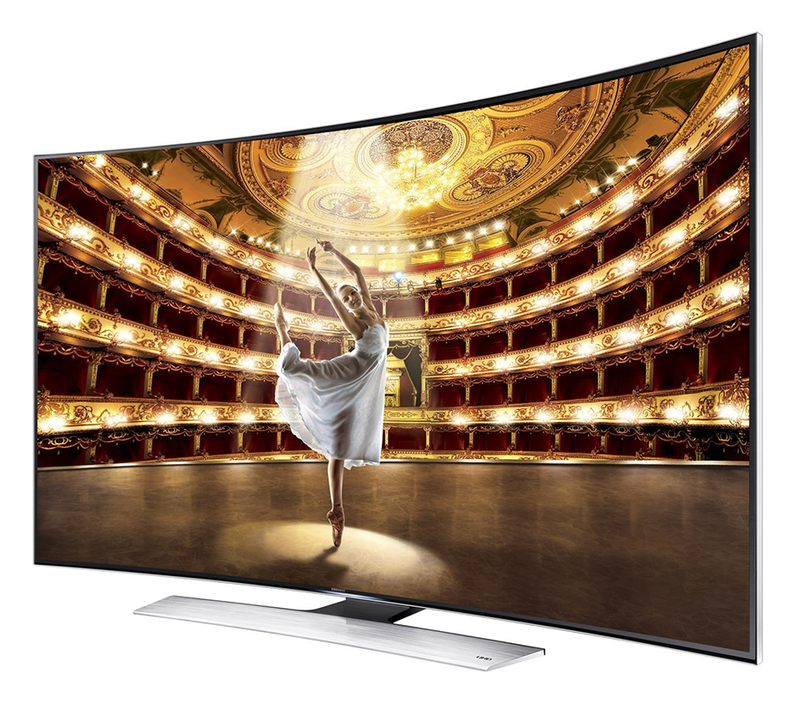 The UN78HU9000 is a curved screen television, and one of only a handful of models with this feature. It’s a neat concept that adds depth to the picture and encourages you to sit closer to the screen. The only drawback that I noticed is the high gloss finish on the screen. The UN78HU9000 has to sit in a dark room, as the curve captures and reflects every visible light. The fit and finish on the UN78HU9000 is excellent, and it’s a classy looking unit that is easily recognizable as a premium model. Even the remote has been carefully sculpted into a classy accent. Speaking of the remote, Samsung has adopted a technology similar to a Wii-mote that tracks your flourishes on screen. Though it does permit easier navigation of the menus, I did have some trouble with it getting confused and jumping around. Not the end of the world, but irritating when you are deep into the menus. The sound from the unit is good for a flat screen; but if you are dropping this much coin, do invest in a soundbar if not a surround system. You won’t regret the extra dollars for sound quality that matches the picture. The UN78HU9000 has full active 3D capabilities, which is fun if you are a next gen gamer. I am not totally sold on the technology for watching movies, but at least you can if a good film shows up. Should you buy a 4K/UHDTV? I’m a young guy, but if there is one easily observable constant, it’s the onward march of screen resolution. If you buy in now, with a good quality unit, you will be ready for all the content that is coming along shortly. Master copies of blockbuster movies are already filmed in 8K. This results in file sizes that are just too big for modern technology, but we can (just barely) provide data in 4K/UHDTV. Studios are easily mastering their files in the resolution required and companies like Netflix are just starting to stream the content. It won’t be long before UHD is as standard as HD. A good 4K UHDTV will likely serve you faithfully for the next 10-15 years. At that point we might all need an 8K screen, but by then your UN78HU9000 will have more than earned it’s keep. As the weather starts to improve, and I find myself making excuses to stay outside, one of the things I miss most is music. You can bet that the instant I own my own home I will be looking for a great set of outdoor speakers. 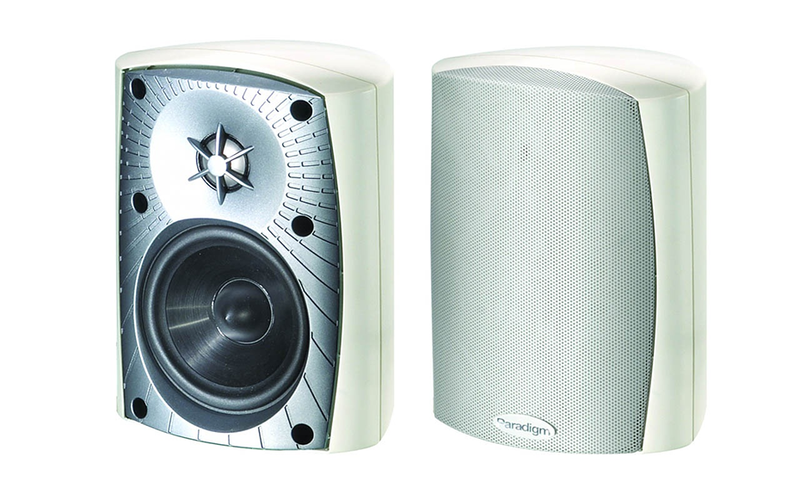 This week I am going to compare two of Paradigm’s most affordable outdoor speakers. The Stylus 170 & 270 are the 2 smallest outdoors speaker sizes in Paradigm’s line. Let’s determine which you should choose to liven up your yard. Both the Stylus 170 & 270 sound great, but in a head to head it’s the 270 that wins by a large margin. I have previously talked about how small cones tend to sound bright. The difference in cone size makes the 170 much brighter than the 270. In my opinion the 170 is just too bright. My music sounded much more natural through the inch larger cone on the 270. The Stylus 170 & 270 share the same tweeter, which does a great job with the high notes. This tweeter is used universally in the paradigm outdoor speaker line (Excluding the in-wall/ceiling models). The cabinetry for the Stylus 170 & 270 is heavy UV-resistant PolyGlass™. The simplest test of good cabinetry is to knock on it with your knuckles. The deader the “thud”, the better the speakers tend to sound. Both the Stylus 170 & 270 return a promising “thunk” when tapped. Mounting systems for the Stylus 170 & 270 are very different. The 170 has a plastic block that is screwed to your mounting location. The speaker is then slotted onto the block via two screw heads protruding from the back of the cabinet. Depending on which slot you use, the speaker can face left, right, or forward. The mounting system for the 270 is much improved with a steel bracket that is screwed to a mounting surface. The bracket then grasps the speaker at the top and bottom. Teeth on the bracket mate with the cabinet, and allow for many more positioning options than the 170. The mounting is complete with the addition of fancy screw caps that clamp the bracket to the cabinet. Being outdoor speakers, both units are weatherproof and UV-resistant. Grilles protect your speakers from errant yard toys, or can be removed to reveal the speakers. You will need to supply power to both speakers via standard bi-wiring. The 170 handles 50 Watts while the 270 would prefer 60 Watts. After reviewing the Stylus 170 & 270 my recommendation is easy. Though the 270 costs roughly $70 dollars more than the 170, the superior mounting system, and sound, are well worth your dollars. The 170 is a solid unit, but the overly bright sound, and plastic bracket, felt like a big step down from the 270. I don’t know of anyone who does not dream of the day they can really pump up the jams with some nice tower speakers. With this in mind, meet my guest this past weekend: The Monitor Audio Silver 6. The Silver 6 is the smallest tower in the Silver lineup from Monitor Audio. The line then progresses through Silver 8 & 10. Considering that the Monitor Audio family starts at MR series then ranges upward with, Bronze, Silver, Gold and Platinum. I would place the Silver 6 in the middle of the lineup slightly towards the introductory models. No matter what level you choose to jump into, Monitor Audio products all have excellent build quality. This European company has clearly put a lot of time and effort into designing and building a high quality product. 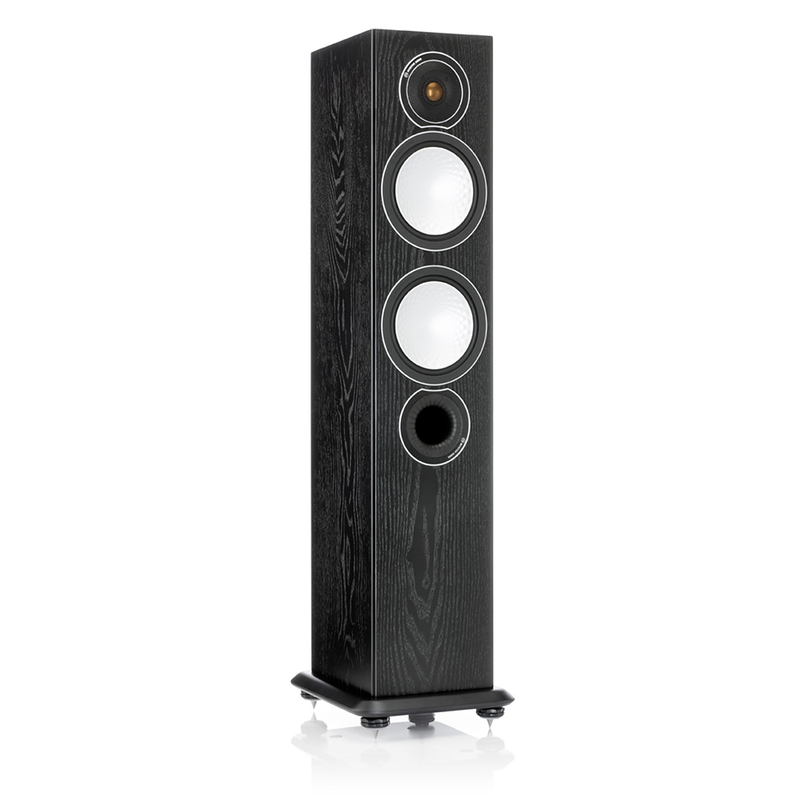 The first thing you should do after purchasing a set of Silver 6 towers is grab the fabric speaker grilles and pitch them into the nearest bin. Monitor builds classy towers and exposing the beautiful ports and cones is requisite part of the experience. Those grilles aren’t hiding anything that needs to be hidden. Given the craftsmanship of the cabinetry, the foot on the tower looks out of place and clunky. My guess is that it’s designed to be universal to all towers of the same stature as the Silver 6. Its shape is likely driven by purpose over aesthetic. It it is by far the most stable speaker on our showroom floor. However, I wish they could have managed this and made it as handsome as the rest of the tower. The Silver 6 listening experience is reminiscent of high quality paper cone speakers. The sound stage is warm and confident with soft characteristics. These towers are ideally suited to Country, Classic Rock and Soft Rock. The soundstage is broad but obviously tuned towards a nuanced middle. I would not recommend these speakers for people who listen to Jazz with a lot brass and high-hat cymbal. Equally, don’t try to pump crunchy Heavy Metal or pounding Club music through these towers. There is no question in my mind that the tuning is intentional. Someone at Monitor Audio was clearly building speakers for their collection of Eric Clapton, and Tom Petty LP’s. With a capacity to handle up to 150W volume is not an issue. There’s nothing like a new set of towers to make your neighbors livid. Higher peak wattage numbers also require greater minimum wattage so make sure your hardware is up to the task. If you have an amplifier that produces less than 60W these towers won’t be able to put on much of a show. Should you own Monitor Audio Silver 6 towers? That’s going to depend entirely on your listening preferences. Choosing a tower is a highly subjective experience. I recommend including Monitor Audio in your “to audition” list. These towers will make the right person very happy. It’s the little things that make me smile, that make my day. I love it when, out of the blue, I find something that exists without pretense. It’s simple, effective and carefully crafted. In a sea of half working, disposable spam, an honest device that works it’s heart out, without asking for much, is endearing. 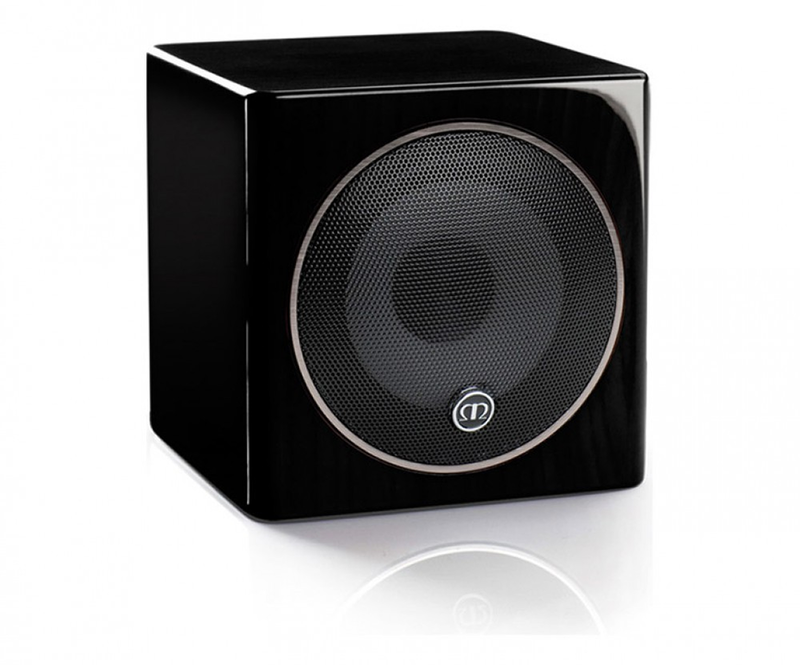 The Radius 45 is a 10cm cube with integrated acoustically transparent screens. Gold screw binding posts with provisions for bi-wire plugs are fitted to the back. The solid build and high quality hardware on this speaker makes it feel like an audio tool. There is a 7.5cm cone in front and a 2cm C-cam gold dome tweeter in the rear. Right here you should hear a record scratch to a halt. The tweeter is in the rear?! Usually we would see the lower frequencies pointed away because long wavelengths sound less directional. Spreading the rumble around a room creates the feel of a larger soundstage. A rear-pointing tweeter with its high, short frequencies breaks all the rules! I must be honest; I was not sure about this setup at all. It goes against everything I know about sound… but it works! Placing this little devil is critically important. You don’t want to put it on an actual bookshelf or in a tight space. You are best advised to mount it on a desktop, a stand, or a wall, using the integrated threaded nut. Both the stand and mount are available through a Monitor audio dealer (like AVU). Providing you have this little charmer on a desktop or properly mounted. The tweeter will reflect sound off your wall creating a very pleasing listening experience. The soundstage feels surprisingly large and bright without being overly sharp. The Radius 45 is potent enough to fill a medium sized room without noticeable distortion. I felt like the sweet spot is at more moderate volume levels when you are sitting closer to the speaker. There is a definite distance where the Radius 45 comes to life. Being a super tiny trooper the Radius 45 is a bright sounding speaker. Sound reproduction is good and very nuanced. However, if you quickly switch between the 45’s and larger speakers there is a noticeable raise in pitch for the 45’s. There are limitations to what can be done with small cones. Physics hasn’t taken a break, but Monitor has certainly found ways to work within the laws. I loved these little speakers. They are a noticeably high quality product and are adorned with simple tough hardware that shows Monitor Audio’s attention to detail. The sound and feel is very mature. I would be proud to show these tiny wonders off as part of a home theatre or small audio setup. The price point is excellent. If you want surprising sound in a small package, there is none smaller than the Radius 45. Every once in a while I have a tough time writing a review because a product is so good, and yet, not quite what you might expect. This is that review. The Paradigm H15NC is possibly one of the best sounding supra-aural (on-ear) reference headphones I have ever tested. The problem: it isn’t supposed to be. The Paradigm H15NC is a premium noise-cancelling headphone. This category usually is reserved for business travelers who want to forget the ten-hour flights they are taking. Noise cancelling shuts out the shriek of the turbofans so Mr. businessman can get to his quiet place. These models often feature compact folding designs and sturdy cases to prevent damage. The Paradigm H15NC does not fold and packs into a fairly large armored case that I think is too bulky for the average traveler. The In-line controls are tiny and tough to press with recessed super stiff buttons. The noise cancelling is also less active than I expected making little difference to the ambient rumbles of the world. Most of the noise cancelling came from the padded earpieces. So I didn’t like these headphones? Actually, I think they are excellent! The instant you stop trying to imagine yourself traveling with the Paradigm H15NC they become phenomenal. 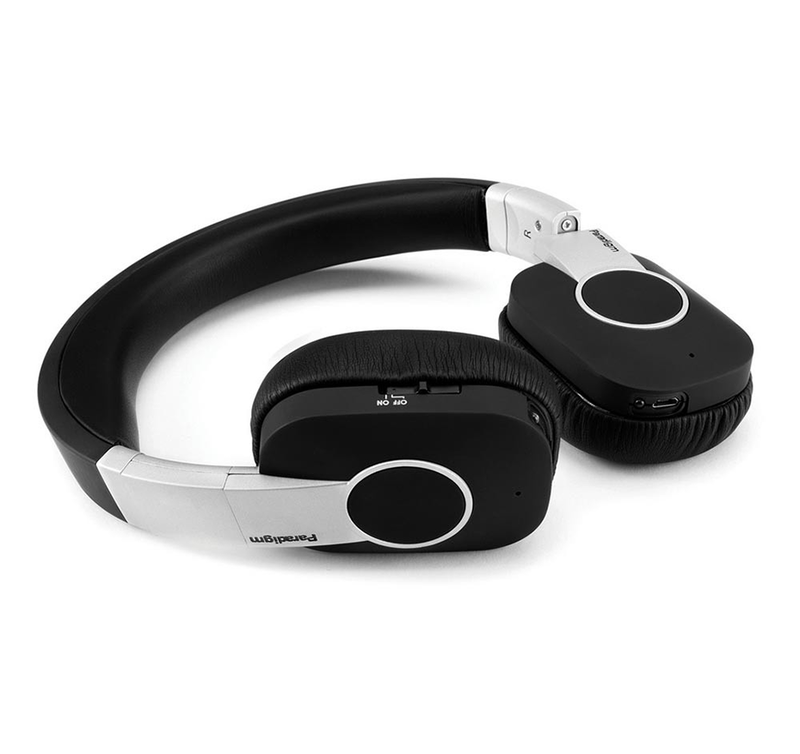 Unlike many active noise-cancelling headphones, you can listen to music without a charge. Though, with a built-in forty-hour battery, you won’t often be without a charge. When the noise cancelling is switched “on” it slightly amplifies the volume, and cuts out a little extra background noise. The sound in the Paradigm H15NC is beautiful and perfectly balanced for the audiophile. Unlike the competitions systems, that often add weird ear pressure and an audible hiss, switching “on” the noise cancelling does not degrade the listening experience. Every instrument is in its place with no one frequency getting pumped or processed. You hear exactly what was recorded. Some of my friends commented that they didn’t like the limited volume levels and studio neutral sound. But these aren’t your teenager’s headphones; these are carefully crafted to operate though their range without distortion, and sacrifice ear-shattering loudness for precision. Paradigm does not stray when it comes to build quality. The Paradigm H15NC are built tough with full metal frames, thick composites, superb leather and memory foam padding. I was able to wear these for a few hours without experiencing ear pain, which is much longer than I can usually tolerate supra-aural designs. So should you choose the Paradigm H15NC? If you want noise cancelling headphones for long haul travel, I would say nope. However, if you want some great headphones to explore your music at home, and really hear what the artist intended, even while simultaneously putting a damper on the neighbors lawnmower, then YES!